This was my first attempt at gluten-free and vegan—although the recipe does also include gluten-tolerant and non-vegan versions—and it was so good and we were so starved for something in the way of a treat that we ate it for breakfast, lunch, and supper, that I then turned around and made a second one the next day. Since we all know about George Washington and his cherry tree story, it seems like an appropriate recipe for President’s Day, even if it is a Monday and not a Sunday. Not sure if Abraham Lincoln liked cherries, but I feel pretty darned certain he would not be able to say no to this luscious cake. I highly recommend whipping up some coconut cream for a topping: Coconut Whipped Cream from Oh She Glows. Peel, core, and coarsely chop apples. Place apples, water, and ½ c. coconut sugar in medium-sized pot on very low and cook until very thick, stirring occasionally, usually about an hour; however be careful to remove from heat if the sauce starts to appear brown in color. It should be yellowish. (You can also do this in a Crockpot; cooking time will be 6-8 hours.) The thickness of the applesauce at this point depends on the juiciness of the apples. Cool, spoon into canning jars or other glass storage containers–about 2/3 full. Makes about 3 cups. Set aside 1 c. Store remaining in refrigerator up to 1 month. Freezes beautifully for up to a year. For each “egg” soak 1 tbsp. 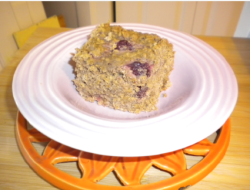 flax meal in 1½ tbsp. warm water for 20 min. Pre-heat oven to 350 degrees. Spray 9 x 12 pan with sunflower oil and set aside. Blend remaining dry ingredients in a large mixing bowl. In a separate bowl, blend wet ingredients with 1 c. applesauce. Then stir into dry mixture. Continue stirring for 5 minutes. Mixture should be somewhat foamy. Add cherries. Fold into batter until cherries are well distributed. Cover bowl with a slightly dampened towel and let batter sit 15 minutes. Pour into prepared pan. Cover again and let sit another 15 minutes. Bake at 350 degrees for 1 hour or until inserted toothpick comes out clean. Allow to cool before serving. Substitute 1 ¾ c. unbleached pastry flour for the following: sorghum flour, potato flour, tapioca flour, and xanthum gum.